The recovery of bald eagles on the California Channel Islands has played an important role in island fox recovery. 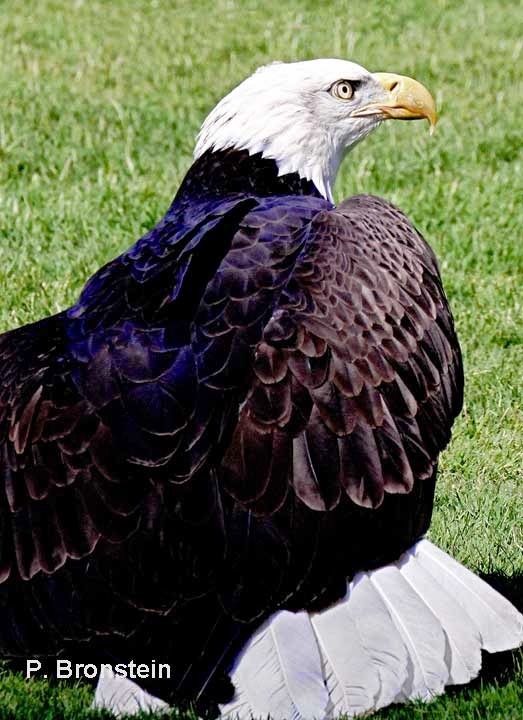 Bald eagles prey on fish and marine birds. 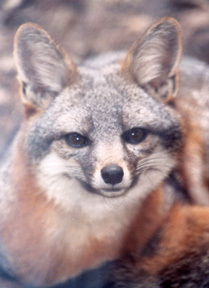 They are not mammal predators and do not actively hunt island foxes. 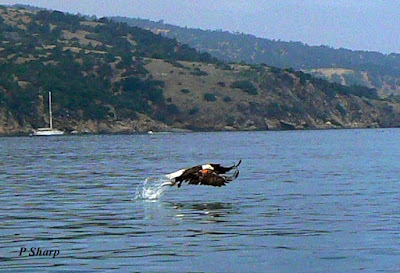 Because bald eagles nest on the Channel Islands, they chase away migrating golden eagles and do not allow them to colonize the islands. With 50-60 bald eagles now living across the eight Channel Islands, no island foxes are known to have been killed by golden eagles for several years. Bald eagles definitely make a difference in the ecosystem for island foxes. But what benefit do island foxes provide bald eagles? 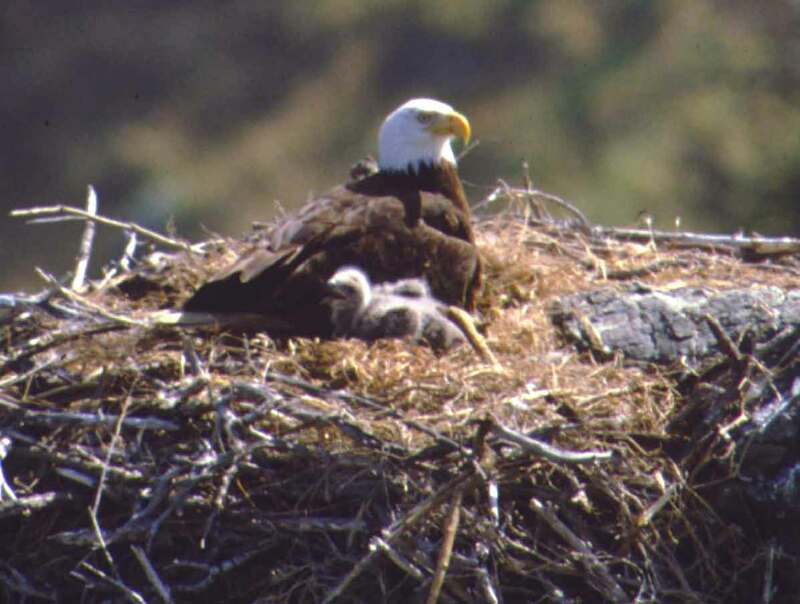 Across the Channel Islands bald eagles are hatching out their 2018 chicks. Channel Island National Park reported that there are 13 active bald eagle nests across the islands this year and at least 22 known eggs. 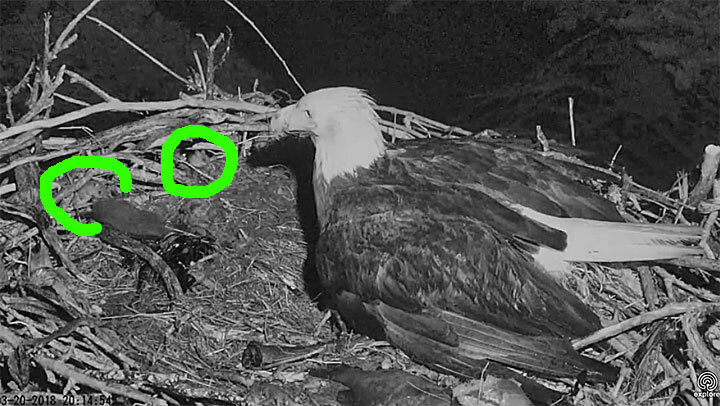 Tonight, close observers saw some unexpected visitors to the bald eagle nest. Along with fish, the parent bald eagles have brought scavenged seal placenta back to the nest to feed their chicks. But with the darkness, something else stole up into the nest to eat the placenta bits. Circled in green, do you see the surprise scavengers? island deer mice. Who would have thought that hungry deer mice would come up into the bald eagle nest to eat meaty placenta. 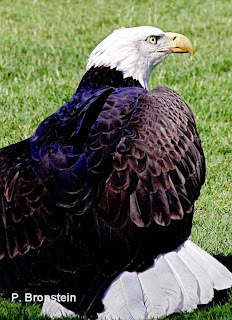 The eagle does not have night vision, it is a daytime hunter. It could hear the munching mice and would occasionally drive them off. Island deer mice are known to eat songbird eggs, and possibly chicks, when given the opportunity, (like when island fox populations were very low). The eaglets are small and without their parent's protection, would they be prey for the gang of deer mice? At one point six deer mice were visible. Island foxes play an important role in controlling island deer mouse populations. Other bald eagle parents on the islands are sleeping soundly tonight, but the bald eagle with the messy nest is wide awake in the rain. It has two jobs tonight: keeping three eaglets warm and dry, and keeping the deer mice at bay. It will be a long night for this bald eagle, it needs an island fox. Island foxes sometimes clean leftover food out of bald eagle nests. Island fox in a bald eagle nest. New discovery of house mice attacking albatross chicks and nesting adults.